The Swift theme sets the stage for youthful, lively brands. 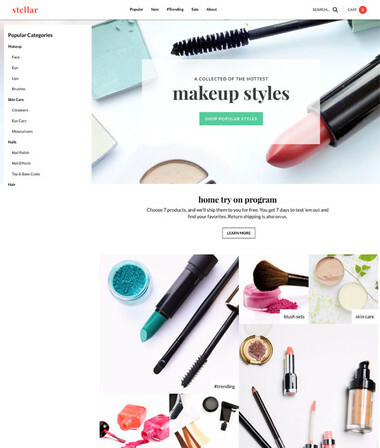 Featuring cheerful and inviting colors, a full-width header image, and quirky but tasteful fonts, this theme is ideal for stores with highly visual products and a fun-loving brand voice. The sticky navigation is helpful but unobtrusive, unfolding with a click into a gorgeous tiered menu with a built-in search bar. 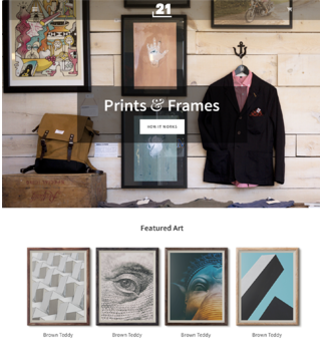 Featured products sit atop a block-like, image-driven introduction to other important pages on your site, and there’s plenty of room for bold, clear calls to action.